A Montana girl happy to be soaking up the SoCal sunshine with my handsome Greek hubby and two adorable puppies. Well, we had a blast at the Greek festival this year – from Greek wine to gyros, Greek pastries and of course dancing! Something new this year was the addition of a wine lounge in the front courtyard area. They had a tasting menu for both white and red Greek wines for $6 for 4 tastings. Typically that area of the festival is used for sweets and coffee, and judging by the line to get in I would say that the wine lounge was a great idea! After the wine lounge we walked to the rear of the church to the beer garden, dance floor and to partake in some delicious Greek food. Dessert too of course! 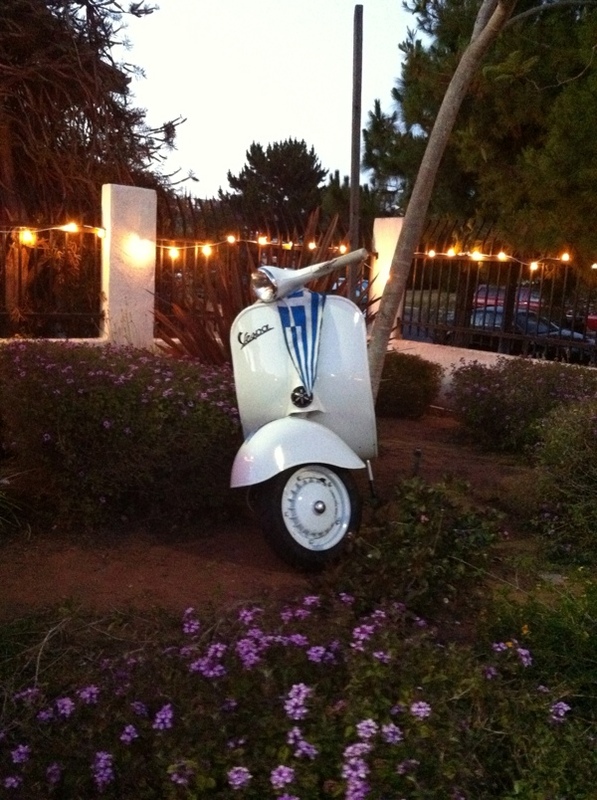 We saw this awesome 60′s white Vespa adorned by a Greek flag in the beer garden, I just had to take its picture, it was too perfect. After dinner we jumped into the fun on the dance floor for a couple of Greek line dances. For the first time I really started to feel like I knew what I was doing! Which for me is a big deal. I usually feel a little lost on the dance floor. Guess I am starting to get the hang of it! Did you go? Leave me a comment and tell me about your favorite part of the festival. Missed the festival? Don’t worry, the fun will continue again September 10-11 2011 with the Saints Constantine and Helen Greek Orthodox Church Greek Festival in Cardiff, hope to see you there! 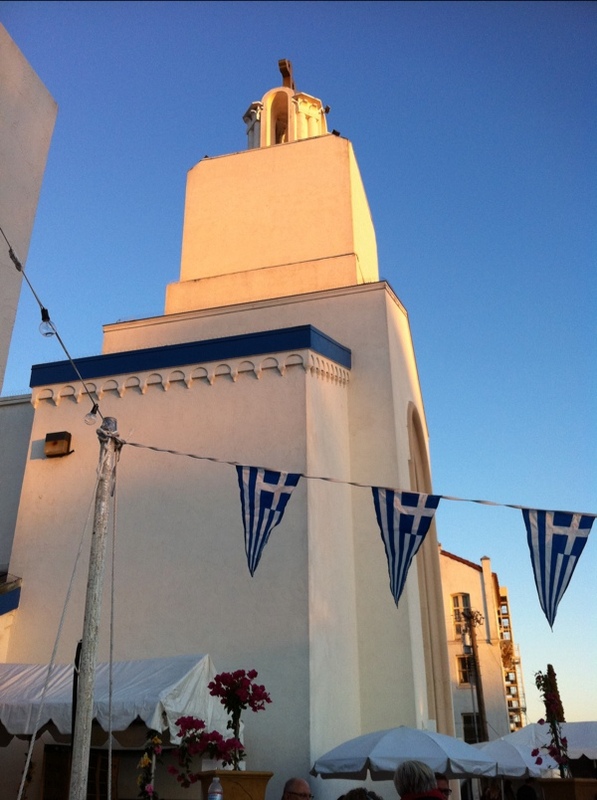 Or visit this site for a full listing of all the Southern California Greek Festivals. It’s only May, but the sun is shining in Southern California and it feels like summer is already here. There is something about a fruity cocktail, enjoyed outside in the evening that brings back memories of tropical vacations and good times with friends. 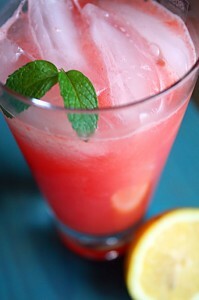 Below is the recipe for Watermelon Lemonade, adapted from the California Sol Food Casual Cooking from the Junior League of San Diego. Step 1: Puree the watermelon in a food processor or blender. Squeeze several fresh lemons and set the juice to the side. Step 2: Mix the watermelon puree, water, lemon juice, vodka and sugar in a large pitcher. Stir to mix well. Cover and place in the refrigerator to chill. To Serve: Fill a glass with ice. Pour the lemonade over the ice and garnish with lemon and sprigs of fresh mint. Enjoy responsibly! Note: Omit the vodka for a non-alcoholic version. Try replacing the sparkling water with sparkling wine or regular tap water for a variation of this cocktail. A karpouzi a day keeps the doctor away! 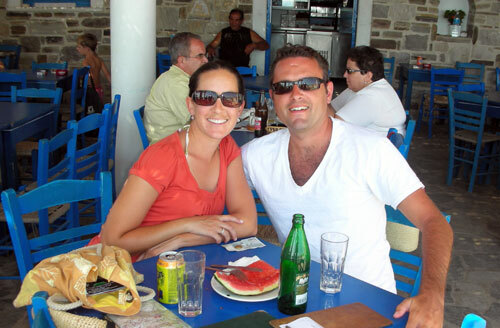 A couple of years ago I was lucky enough to have a chance to visit Greece for 2 weeks with my, at the time boyfriend, now husband. There are so many things that I can tell you about that trip, but today as I was walking through the grocery store deciding what to have for dinner, I strolled by a large display of watermelons, and was instantly transported back to Greece. Watermelon, or Karpouzi (CAR-POO-ZEE) in Greek, is a staple in the Greek diet. While in Piraeus, we stayed with Steve’s Theo (Uncle) Spiro and his family. Every night after dinner, Theo Spiro would eat almost half a large karpouzi. What I know now is that not only is this a great dessert choice, it is choc full of valuable vitamins, and antioxidants, such as the free radical neutralizing, lycopene. It is rich in vitamins, C, A and B. It also is a good source of thiamin, potassium and magnesium. Giving it many added benefits when it comes to energy production (thanks to vitamin B6). And according to some studies, reduces the risk of developing various diseases such as heart disease and some cancers, such as colon cancer, reduces the airway spasm that occurs in asthma, and can alleviate some of the symptoms of osteoarthritis and rheumatoid arthritis. 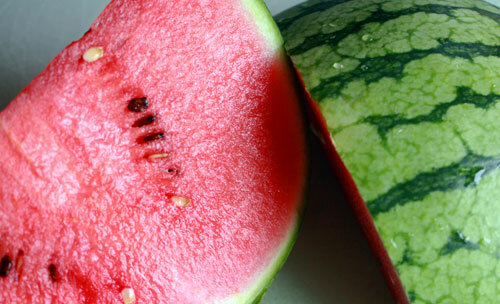 Watermelon is a nutrient rich food. Because it has such a high water content and only contains 48 calories per cup, it delivers more nutrients per calorie than many other fruits. The benefits go on, and on. I guess Theo Spiro, who is also a Doctor, is on to something. So if you happen to wander through the produce section and see some fresh watermelon in stock this season, stock up! Karpouzi for everyone! 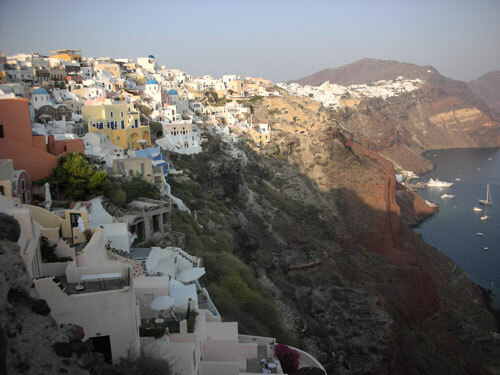 And for us, a little walk down memory lane of our trip to Greece as we feast on karpouzi for dessert tonight! 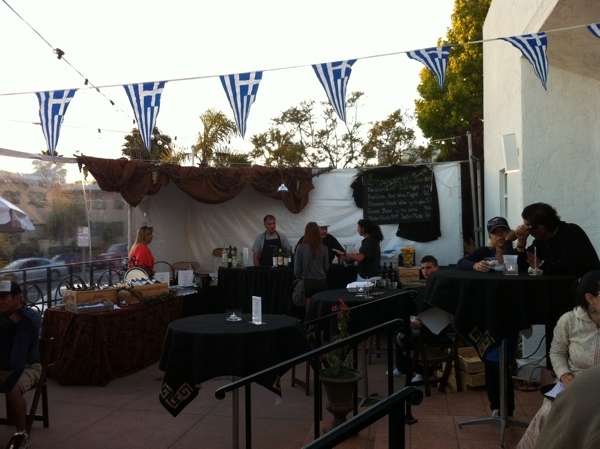 It’s almost that time of year again, save the date for the annual San Diego Greek Festival at St. Spyridon June 3-5, 2011 in San Diego! The Greek festival is full of good eats (including homemade Greek pastries and cookies! 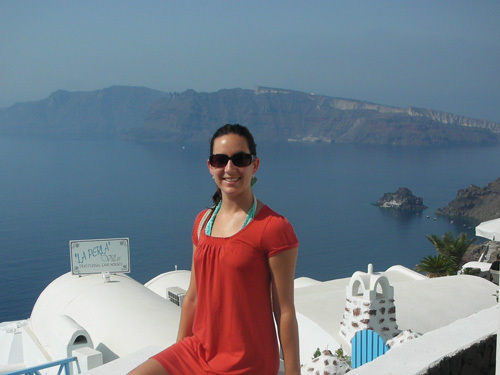 ), libations, Greek dancing and a great place to share Greek culture with Greeks and non-Greeks alike. You don’t have to be Greek to enjoy the festival. But you definitely should come hungry. From the grilled lamb to the homemade baklava you will find many temptations to enjoy. You’ll want to try some Greek dancing to burn it all off! And don’t be intimidated. Greek dancing isn’t as hard as you might think, there are a few Greek line dances that are pretty easy to follow along. I hope to find time to do a how-to post on dancing, but in the mean time this article did a good job of outlining the dance types and etiquette, here. Even if you don’t venture onto the dance floor, you can enjoy the live music and dancing. I especially enjoy watching the young dancers in traditional dress that typically perform during the day. One of my favorite things about Greek festivals is the music. And actually beyond the festival is the timeless element of the music. The same songs are enjoyed by multiple generations and will continue to be enjoyed by future generations. The lyrics are akin to folk music with their story telling, and very poetic. They are a deep part of the tradition. Can’t make the June date? Don’t worry, if the fun will continue again September 10-11 2011 with the Saints Constantine and Helen Greek Orthodox Church Greek Festival in Cardiff. 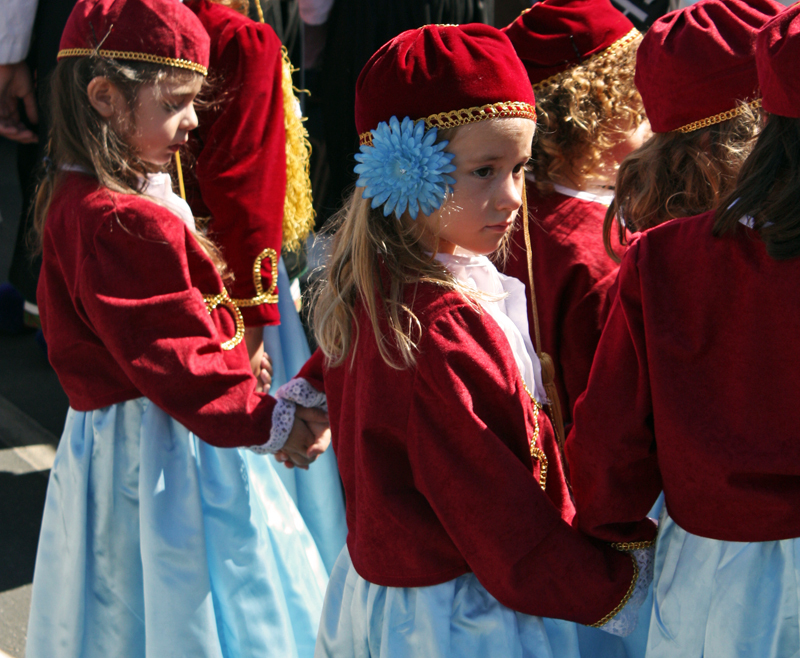 Or visit this site for a full listing of all the Southern California Greek Festivals. My Dad shared with me a very interesting video. As part of the Blue Zones tour, a group visited the small island of Ikaria in the Aegean Sea to discover why this location is home to some the longest living people in the world. Having been to Greece and now living as part of a Greek family, I found this clip not only interesting, but very accurate to the Mediterranean lifestyle. One thing I learned that I had not thought of before, was about the health benefits of drinking goat’s milk. Something new to add to the repertoire! Wondering how to say Happy Easter this weekend in Greek? “Christos Anesti!” or “Christ is risen!” will be the phrase commonly heard, to which one replies ‘Alithos anesti’ (‘Truly He has risen’). You may also hear “Kalo Pashcha!” or “Good Easter”. 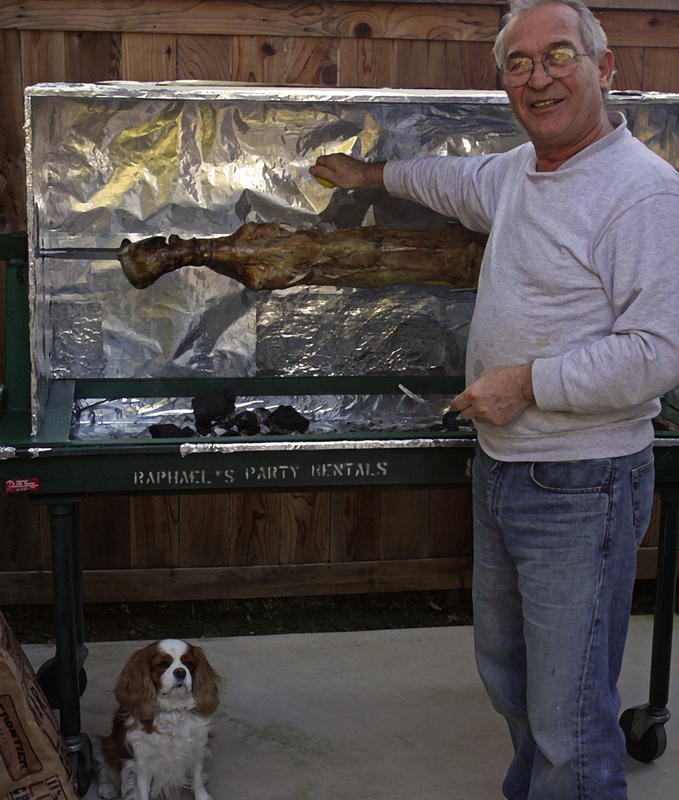 Another fun fact is that lamb (or “arni” in Greek) is a traditional feast on Easter in Greek culture. Recently we roasted a lamb for New Years. Basically any major celebration can be made extra special by a lamb. And I have to say as weird as I thought it was at first to see an entire animal on a rotisserie (or “souvla”), the lamb roast is as equally entertaining as it is delectable. The flavors of the lamb, especially when garnished with fresh squeezed lemon and hand fed to you lovingly by the chef himself fresh from the soulva, are quite simply out of this world. The “goodness” as some say. So whatever you do to celebrate Easter this year, take time to savor the flavors, both of the food and the memories they create. Because as my wise father-in-law would say, the memories are one of the only 3 things that you take with you from this world. But more on that later. Happy Easter everyone! Christos anesti!